Samsung Galaxy Mini 2 mobile lands in the UK | What Hi-Fi? Samsung's Galaxy Mini 2 mobile, first seen at Mobile World Congress (MWC) in Barcelona, is now available in the UK. The Mini 2 – successor to last year's Galaxy Mini – sports a 3.27in HVGA touch-screen display together with a 3MP camera and the same 800MHz processor and 4GB of (microSD-expandable) internal memory. 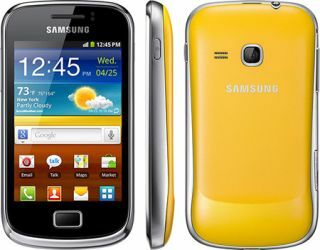 It comes with an improved 1300mAh battery capacity, 4GB of storage, the Android 2.3 (Gingerbread) operating system and Music Hub app (downloadable from Samsung's App Store). Bluetooth, USB and wi-fi connectivity comes as standard, along with a MicroSD card slot to expand the storage up to 32GB. There's video support for MPEG4, H.263 and H.264, while audio formats supported include MP3, OGG Vorbis, AAC, AAC+, WAV, WMA and FLAC.